Vote for the SLAMbassadors UK People’s Choice! We are asking you to VOTE for your favourite to win the SLAMbassadors People’s Choice Award. Five lucky voters picked at random will receive a YPN notebook. We are also running a competition to be the SLAMbassadors UK Reviewer, includes expenses paid trip to London! Please note this opportunity closed in March 2012. SLAMbassador Tiana Oldroyd with commended poet Michaeka. Photo: Hayley Madden. 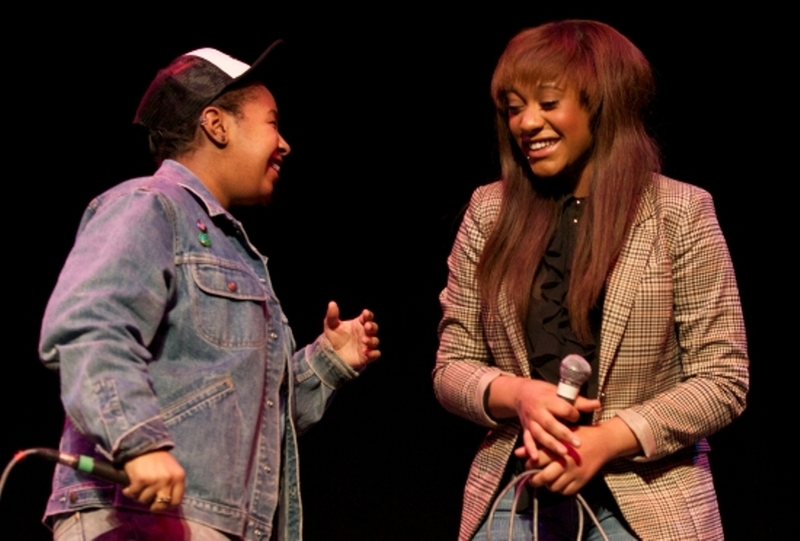 SLAMbassadors is a national championship for young spoken word artists in the UK. Young people from all over the country sent in videos of themselves performing poems to camera, from which eight winners were selected to perform at a live showcase event at the 100 Club on 1 April. For the first time, we are inviting you to choose your favourite winner. The poet with most votes will win the title of SLAMbassadors UK People’s Choice. Watch the eight finalists’ videos below and select your favourite. Write one sentence (only one!) on why it’s your favourite. Pop your sentence in the body of an email along with your name and age. In the email subject bar write “People’s Choice” followed by the name of the poet you would like to win the People’s Choice Award. Voting closes Midnight Thursday 29 March 2012 and the winner of the People’s Choice Award will be announced at the showcase on 1 April. Five voters will be randomly selected to win a Young Poets Network Notebook. The SLAMbassadors UK reviewer will have the chance to meet the SLAMbassadors finalists, the Slam’s Artistic Director Joelle Taylor and star poet Dizraeil. Your expenses will be paid for you to come down to London to attend the SLAMbassdors showcase event on 1 April, and you will be asked to write a review of the event to be featured on the Young Poets Network and SLAMbassadors UK websites. Select your favourite SLAMbassadors UK finalist video and write up to 500 words on why you think it is the best performance. Copy this into the body of an email along with your name, age and address. Write your name and “SLAMbassadors Reviewer Competition” in the subject bar. The chance to be the official SLAMbassadors UK Reviewer is open to 16-25s living in the UK. The SLAMbassadors Reviewer competition closes midnight on Thursday 22 March 2012. Winners will receive a trip to London including travel and food. We will also be offer accomodation, should the winners live further afield. name joslyn, age 34 address united states. i like Renne’s poem i think its quite interesting how he spoke about stupid being abused and ridiculed. the rise and fall of stupid. rooting for u Renn u can do it. Hi Joslyn, thanks for listening to the poets. If you would like to vote you need to email your sentence, along with your name and age, to hhopkins@poetrysociety.org.uk . We’ll be counting up the votes emailed to us and the “People’s Choice” will be announced at the SLAMbassadors UK Showcase on the 1st April at the 100 Club in London. renne pascal because his video has the most meaning and it comes from his heart, also these are real life problem/scenario. Hi Mitchell, Thanks for listening to the poets. If you would like to vote you need to email your sentence, along with your name and age, to hhopkins@poetrysociety.org.uk . We’ll be counting up the votes emailed to us and the “People’s Choice” will be announced at the SLAMbassadors UK Showcase on the 1st April at the 100 Club in London. Good job Renne go all the way to the top. Thanks for listening to the poets. If you would like to vote you need to email your sentence, along with your name and age, to hhopkins@poetrysociety.org.uk . We’ll be counting up the votes emailed to us and the “People’s Choice” will be announced at the SLAMbassadors UK Showcase on the 1st April at the 100 Club in London. Hi Myer! Thanks for listening to the poets. If you would like to vote you need to email your sentence, along with your name and age, to hhopkins@poetrysociety.org.uk . We’ll be counting up the votes emailed to us and the “People’s Choice” will be announced at the SLAMbassadors UK Showcase on the 1st April at the 100 Club in London.